When: August 17th 2013 Weekend - Based on the timing it is possible to attend the Poker Run and dinner on the Saturday only and be back on the mainland that evening. 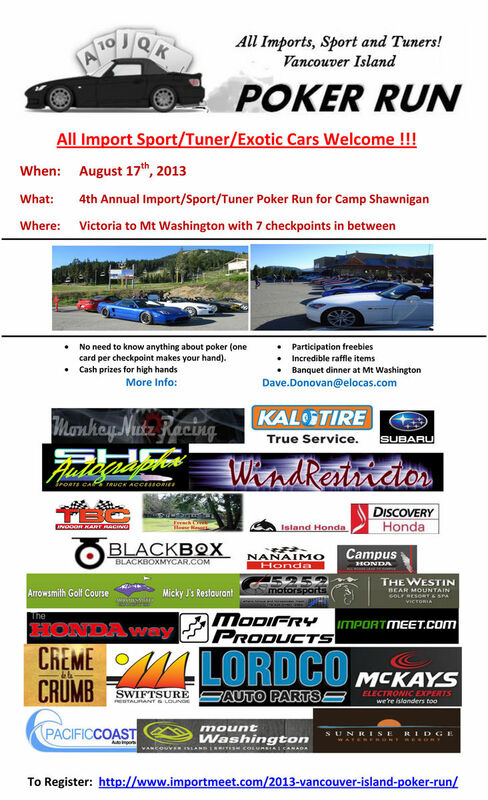 Poker Run with banquet dinner at Mt Washington - Saturday 17th all day. Brunch and cruz back to Victoria - Sunday 18th. Where: Starts in Victoria at 9:30am and ends at Mt Washington in the beautiful Comox Valley approximately 6:30 with dinner and awards to follow. What is a Poker Run? Since I have been asked I thought I would basically explain a Poker run and how it works. A Poker run is a rally that doesn't have anything to do with speed. Everyone starts from the same location and either travels as a group or single and heads to a common ending point (in our case Mt Washington Resort in the Comox Valley). Along the route there are checkpoints that each vehicle must get to. You are supplied with a detailed map but none of the locations are hard to find. For those that know the island they can take off as a single or as a group and head whatever way they wish. Those that don't know the island and want to have more of the scenic tour can go with another group that will have some local owners and we will take the ocean routes to the checkpoints. At each checkpoint will be a deck of cards. Each car selects a card. If you don't like the card you get, you can pre-purchase "mulligan" tickets which allow you to exchange the card at the checkpoint and return the card you first selected. Mulligan tickets are purchased at the start of the event and you can only purchase 3 tickets. Of course you "draw" a card you don't get to see what it is until after you have it in your hand. Once you get to the finish you should have 7 cards. From those cards you make the best Poker hand you can and submit it to the event people. We have a nice sit down dinner at Mt Washington Resort (last year was Carved Roast Beef and Chicken Cordon Bleu with a great selection of salads and other nice things). During the dinner you are encouraged to purchase tickets for the silent auction items with all proceeds going to Camp Shawnigan. After dinner we award the silent auction items and we then award prize money to the 1st, and 2nd, and 3rd place card hands. After that we have the bar and the facilities until midnight. Most of the participants will stay on the Mountain in various accommodations that are available. Participants of the Poker Run do get a special rate on the Mountain. It is also possible to attend the festivities and still make it down to Nanaimo to catch the ferry to the mainland, should staying overnight not be an option. The next day we normally cruise back to Victoria as a group stopping someplace for lunch. This year it is proposed that we may include a further 'sight seeing' tour further up the island, before making our way back. Thanks and I hope you can make it out to this worthwhile event. Search this forum for Poker Run to find the threads from past Poker Runs. Search the S2Ki (my home forum) for past Poker Run threads with images. Go to this page and enter "Poker Run" into the search box. I am still working on a starting point. The old starting spot has agreed to allow us to start from there again but I may look for something a bit closer to the ferries to accomodate people taking the ferry over to the island on the Saturday morning. The menu has also been determined. Last edited by DDonovan; 04-30-2013 at 09:09 PM. Although you don't need to know anything about poker to participate in the Poker Run, below I have include a listing of poker hands and their ranking. You will receive 7 playing cards, one from each checkpoint. When we get up to Mt Washington you will submit your hand. We will review it and the top three hands will win cash money! Last edited by DDonovan; 05-12-2013 at 10:13 PM. For those of you that live on the island, this really is a great event at a good price. For the entry you get a BBQ lunch at Discovery Honda (checkpoint 2), and a wonderful buffet dinner at Mt Washington. You also will receive a bunch of freebies from some of the checkpoint and donated by sponsors. Everyone goes home with something. You also get the opportunity to win some very good sponsor donated items. Last year we gave away a week in Whistler, a 2 day ski trip with accommodation to Mt Washington, a number of golf tours, and much much more. You also get the chance to win the poker run event itself. Last year we gave away $1,000.00 in prize money. Lastly your participation fee also includes a modest donation that goes directly to Camp Shawnigan. I have a deal with them stating that the money will not go to administrative fee's, but instead go directly to the kids who's parent cannot afford the registration fees. It currently costs over $2,300.00 a week to send a child to Camp Shawnigan. Those of you that are not from the island, you can come over on the morning ferry. We don't start the event till 9:30 so you have time to arrive on the island and make it to the starting point with no problems. You can participate in the event, have dinner, and leave by about 9:30 in the evening and still make it to Nanaimo to catch the ferry to the mainland. We had a number of people do that last year and the timing was perfect. So no excuse..., register now! Last edited by DDonovan; 05-24-2013 at 12:56 PM. Route is set for this year. This year, I will not be printing off the maps and supplying you with them. Most people have GPS in which case you can just get the address from the maps here, or if you do need the maps, please print them off and bring them with you..., Trying to save some trees. Last edited by DDonovan; 06-04-2013 at 09:27 PM. Planning continues on the Poker Run. Registrations continue to come in as well but it has slowed. Give this event some serious thought. Contact me with any questions. Last edited by DDonovan; 06-10-2013 at 09:54 PM. I have contacted Mt Washington administration, and they have once again graciously offered us a discount on accommodations. few different names floating around. Poker Run participant?" Our discount code is "POKER". Also some of you have agreed to go ahead and pay the registration fee of $25.00 which, if you end up not making it to the event, will go directly to the charity. I will be following up with an email, but if you could send that in, that would be much appreciated. Those of you that have confirmed your attendance, and have not arranged something with me..., feel free to purchase your entry tickets now. Payment options were supplied in your auto responder when you registered. Last edited by DDonovan; 06-20-2013 at 08:43 PM. Only two months left till the Poker Run. Registration cut off will be August 10th. I need to confirm the food count and get the numbers off to the event sponsors and checkpoints. Registration has slowed down a bit. If you have even been thinking of attending this event, go up and register now. Help me to help the kids, and have a great day in the meantime. Don't hesitate to contact me if you have any questions. If you can't make the Poker Run for whatever reason, and just want to meet us up on the Mountain for dinner, that is perfectly fine, just let me know. If your hesitating because of the costs, let me know and perhaps we can work something out. Participation is important to the event. Don't forget that there is a pre-event meet, on the Friday, August 16th. That meet will be at the starting point of the Poker Run. We will get together and I can give out any instructions, collect some payments, and be around for any questions. We normally go for a short cruise and get some dinner/appies. Let me know if you intend to make it out to the pre-event meet. If you cannot attend the Poker Run, feel free to come to the pre-event meet. I continue to work on getting some really nice raffle items and I think once again this year, you will be surprised at the number and the quality of items. Lastly, remember that I will not be supplying maps this year. You can print out the ones that I posted previously in this thread, or bring your GPS, or both. If you have issues printing off the maps, let me know. Anyone that has confirmed that they are going to attend, please start to arrange payment if you can. If you have not confirmed your attendance, please do. Thanks in advance. Last edited by DDonovan; 06-28-2013 at 12:55 PM. - Autociety - $150.00 gift certificate for Photo Shoot. - Gift certificates from Lordco. - Gift certificate from Mad Man McKay's in Western Communities. Plus all the smaller swag type items that are coming in. These items are all put onto a table and during the evening you have the opportunity to purchase raffle tickets in the amounts of $5.00, $10.00, and $25.00. Each item has a bucket in front of it with a description of the item, and information about the donator, as well as the amount of ticket that will win that item. So say you are wanting the BlackVue camera, I might put a ticket value of $25.00 on that item. You put a $25.00 ticket into the bucket. During the evening we will draw from each bucket and the winner wins the item. So you won't pay anymore than $25.00 for ANY donated item. All proceeds go directly to Camp Shawnigan. Don't forget to make accommodations if you are staying up at the Mountain with us..., see above postings for the reservation information and our Savings Code. Lastly, if you can pay me now that would be great and takes one more thing off my plate (or arrange for payment)..., also if you have stated that you are bringing a passenger but did not supply a first name, please do that, and lastly if you can confirm your attendence yet, please let me know. Last edited by DDonovan; 07-12-2013 at 11:47 AM. Well only 5 weeks left. All the logistics are in place. I am still recieving some great sponsor items and response, has once again, been fantastic. Registrations continue to come in which is great. We are currently at 36 cars, but I am hoping to hit the 50 car mark this year. Only you can help me get there. Keep in mind that this is one excellent charity and the event itself is a whole lot of fun. For example, over 75% of the participants are repeat participants with 35% having attended all 4 Poker runs, and 40% having attended at least 2 poker runs in the past. - Ski Package for 2 at Mt Washington Resort, includes 4 ski passes, and mid week accomodations for two nights at Mt Washington resort. - Gift certificate from the Keg Restaurants. - Full auto detail from Discovery Honda. - various participation swag and door prizes. If you can pay for your registration now, that as well would be great and much appreciated. I spoke with Mt Washington today and they want me to confirm my numbers no later than August 1st. I can allow a handful after that but not many, so even if you are thinking of attending, please fill out the registration form. Lastly, as I say, I want to hit 50 cars this year and blow our previous donation record out of the water.., last year we managed to raise just over $5,000.00, help me to beat that. This is a great event and an excellent charity. Register now and help me to hit my target so we can send kids to summer camp. Last edited by DDonovan; 07-17-2013 at 10:39 PM.